Finally, the last set I created for the Transmogolympics! The rules for this event, the equestrian, were to make a set that coordinated with one of the horse mounts (the zebra was not considered a horse mount). 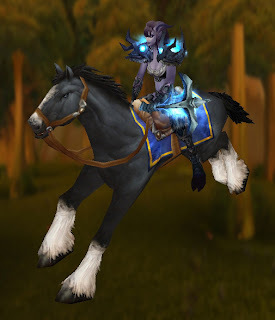 At first I was going to design a set based on the spectral steed you get from Tol Barad, but for some reason I just couldn't come up with anything good. The black stallion was the first mount I ever purchased, long ago when you could only get it from Menethil Harbor! The black and blue on the mount seemed to fit perfectly with the Might of Menethil (which, the horse originally being from Menethil, made sense to me to put the two together, hah) but since that mace is no longer in the game, I used a different item with the same model. For the rest of the set, I chose black items with hints of blue, or as close to it as I could get. So this concludes my weekly feature on all the sets I used for the Transmogolympics. I hope you enjoyed looking at them as much as I did making them! The freestyle event in the Transmogolympics was one of the most fun, but also one of the hardest. There were no restrictions to follow for this one, so it was a little difficult to pick out exactly what I wanted to do... the only thing I knew for sure is that I wanted it to be designed for a gnome! 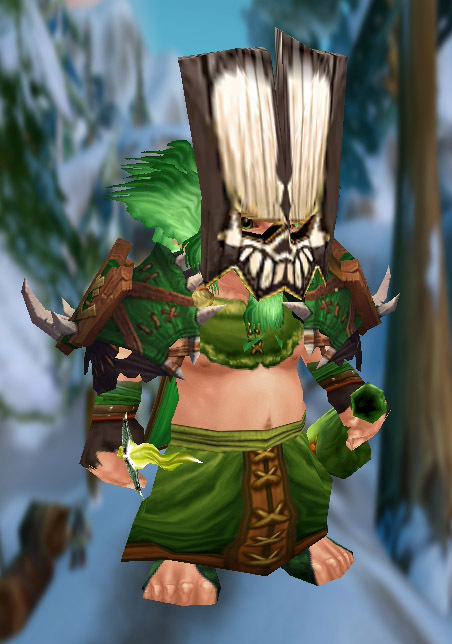 At first, I was going to do a stereotypical garden gnome set, but then I remembered I still had that Bad Mojo Mask in my bank way back from vanilla WoW. I guess that was all the inspiration I needed. Next week is the final event, the equestrian! I think out of all the transmog sets I made for the Transmogolympics, this one was my absolute favorite. I adore the red and silver colour scheme! Too bad it didn't win any medals, but I still love it. 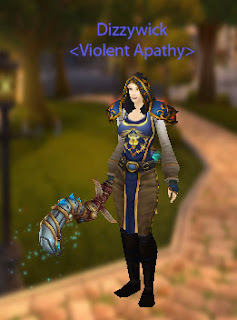 I should note that my version of WMV doesn't have any of the new Pandaria gear so the tabard in the picture is similar, but not what the Tushui Tabard actually looks like.